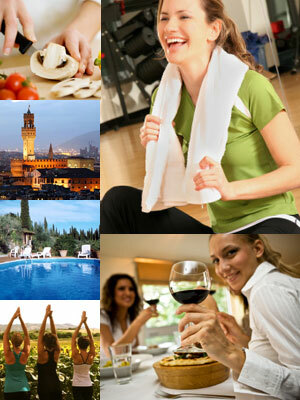 Want a fabulous weeklong getaway with daily cooking, yoga, and meditation classes, along with excursions throughout beautiful Florence and Tuscany? Start the sunny season out right and take a trip to beautiful Tuscany this May with me and my friend Anna Fidz, yoga teacher and kindred spirit who trained in the Integrated Sciences of Hatha, Tantra and Aryuveda yoga tradition at YogaWorks in New York City. You can bask in the sun, enjoy the private pool and daily yoga and cooking classes, relax, socialize and explore the many beautiful and tasty offerings that this gorgeous part of Italy has to offer. Tour includes sightseeing trips to Florence, culinary walking tours, and a tour of a winery with wine-tasting and lunch. Since there’s limited space (12 people), please let me know right away if you’re interested to participate. Daily cooking lessons with a focus on healthy foods. Beginners welcome. Yoga/meditation classes twice a day. Beginners will be accommodated. It contains a large kitchen, dining room, sitting room with satellite TV, relaxing garden with fish pond and a private swimming pool. 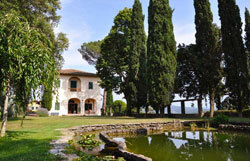 It is situated in the heart of Chianti winemaking region, just a few kilometers south of Florence. Pricing is for double-occupancy rooms (separate beds and own bathroom). Limited to 12 people, all ages welcome. Package price includes daily yoga, meditation and cooking classes, meals and accommodations for 7 days/nights with arrival & departure on Saturday noon. Wine-tasting with lunch at regional winery. Culinary tasting and shopping at the San Lorenzo market. Use of private pool, art room. Tour guides for select trips. Excluded are airfare and transportation to/from airport. Wine will be available at cost. Transfers between villa and train station can be arranged. To reserve your spot, we will process a 300 Euro deposit through the Paypal button below. For more info/detailed schedule, please email Anna or Jennifer. Since there’s limited space, please let me know right away if you’re interested to participate. Once you have confirmed availability with Anna or Jennifer, please click on the PAY NOW button below to submit your 400 USD deposit to reserve your space. Payments are securely processed through Paypal — though you do not need a Paypal account to complete your payment.